Amidst the amazing features in QuickBooks Desktop, emailing directly from within QuickBooks save a lot of time and effort doing things. I will very quickly share “how to setup email in QuickBooks” to a narrative of one of my friends having small business and they use QuickBooks for accounting for years and surprisingly they didn’t know, how to email from QuickBooks directly? We had been going to see the local basketball game for many years after work and I never liked getting late for it because of my friend, telling me to wait as he got handful of Invoices to be emailed to the customers. One evening, I thought reaching out to his home-office without telling him to check his business volume that he tells me about every evening that makes us late. Then, I found him making the invoices first, then print them, then scan them and finally send as an email attachment to their customers and they were never more than 10 a day. Explained him about inherent emailing features of QuickBooks Desktop and configured that too. I was rewarded with a pitcher full draught beer that evening and we never got late for anything pleasurable to us ever. Next morning, I sat to scribble to help others using QuickBooks Desktop to take benefit of the “QuickBooks Emailing Facility” too. Take a Look. Ease of directly emailing Invoices, Estimates to your customers. Send Payment Reminders to your customers via emails. The details are automatically fetched from the customers and vendors. You can import data from spreadsheets and add more attachments up to 2 MB’s. QuickBooks Emailing can also be used for sharing reports within offices or departments. An email address from any of the service provider. Details of the server type. OPTION 1: How to Setup Email service in QuickBooks? 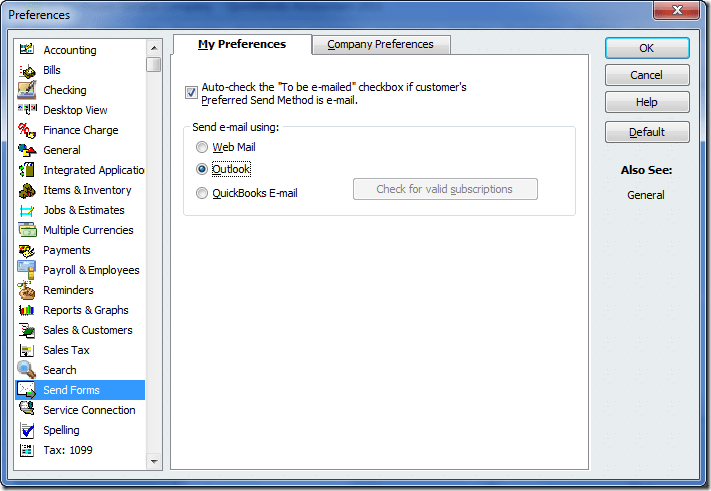 Select QuickBooks Email Settings while setting up the email in QuickBooks. Fill in the required fields requesting email address, username, password and the applicable incoming. And outgoing email settings and server details and you have done for emailing. As QuickBooks doesn’t saves a copy of the emails that you send. It recommended to enter any of your email address for tracking purposes. OPTION 2: Setup “QuickBooks Email via Outlook”? Your outlook profile can easily link to QuickBooks Desktop in order to send Invoices, Estimates, Reports to your vendors and clients and they go as PDF attachment with the email. You can set it up following simple steps underneath. Configure the Outlook with the email address that you wish to use for emailing from QuickBooks is it is not. Open you QuickBooks and open the Edit menu from the menu bar on the top. Select Preferences and then Send Forms. 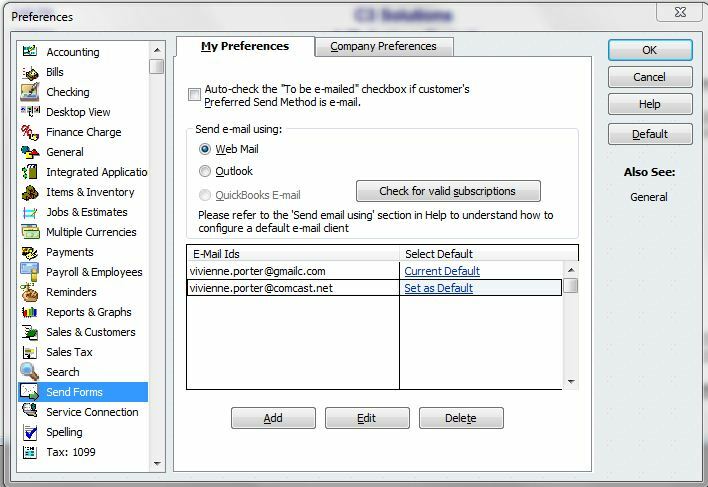 Close the Preferences Window and try emailing something to yourself from QuickBooks for testing purposes. If you have emailing hosting service from Gmail or Yahoo or you have a mail account with them. You can link it for sending email from QuickBooks with easy steps. Which are almost similar but a bit different in terms of SSL Security, SMTP Server and Port Configuration that may differs as per the email service providers. Select Send Forms from the left pane. Select My Preferences Tab and select the Webmail Radio out of the options that you see. SSL Security check box should be select as information from your service provider. Put the correct SMTP Server and Port Configuration and Click OK and try sending the email to yourself and check if you receive it fine. I hope you won’t miss or get late for anything pleasurable to you and you are able to “send the emails from QuickBooks” now. For more clarification or “problems sending emails from QuickBooks” contact our QuickBooks ProAdvisor Support at 1-877-263-2742 (Toll-Free) for instant support.